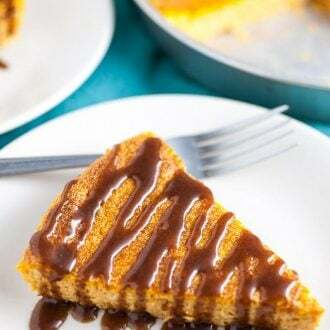 A light and fluffy Japanese-style pumpkin cheesecake recipe topped with a rich cinnamon and nutmeg infused caramel sauce. The perfect easy fall dessert! Not feeling up to pumpkin pie? Let this delicious pumpkin cheesecake grace your table this fall! We’re in the midst of fall baking season and I couldn’t be happier about it. Fall baking means all kinds of apple and pumpkin desserts. When it comes to desserts, my heart definitely belongs to pie. For my money, there’s almost nothing better than a scratch-made pumpkin pie and a strong cup of coffee. Baking a pumpkin pie from scratch is a bit labor intensive, though. Sometimes it’s nice to bake a dessert that doesn’t involve rolling out pie crust and scooping out pumpkin innards. That’s where this Pumpkin Cheesecake with Cinnamon Caramel Sauce comes in. It’s easy to prepare and it’s light and fluffy but still has that decadent quality that we expect from fall desserts. Best of all, it tastes a lot like pumpkin pie! This pumpkin cheesecake recipe is super easy – I promise. It’s a Japanese-style cheesecake which means that it’s extra light and fluffy. There is no crust and the texture ends up kind of ‘souffle-like’. It’s not dense like a New York style cheesecake. I love cheesecakes of all kinds but this one is fun because it’s a bit different than some of the more traditional types. The first step is to heat the oven to 350 degrees. As the oven heats, separate 6 eggs into two different bowls – Yolks in one bowl and whites in the other. Next up is to whip 1 8 oz. package of room temperature cream cheese with a hand mixer until it’s light and fluffy. 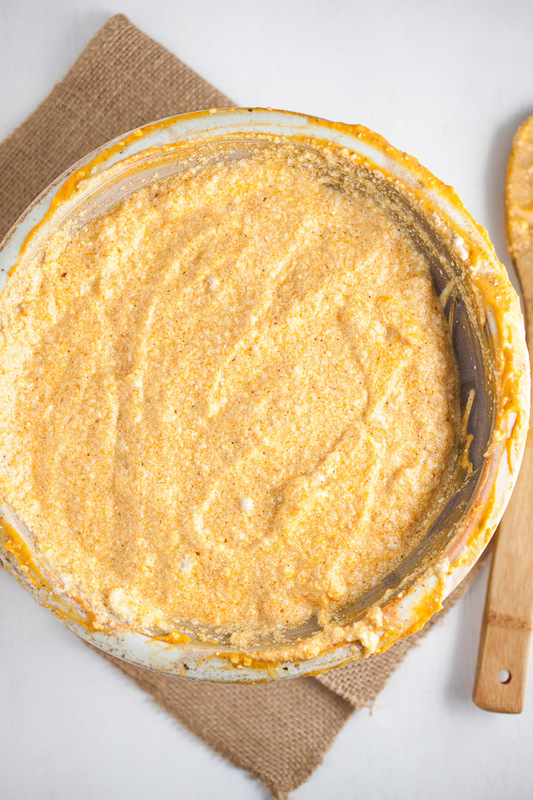 Add the whipped cream cheese to the egg yolks along with 1 cup of pumpkin puree (not pumpkin pie filling), 1/2 cup sugar, and 1 tsp. vanilla. Mix until completely combined. Next up is to make some meringue with the egg whites. Whip the egg whites using the whisk attachment on a Kitchen Aid mixer on medium-high speed. This process should take about 7 to 8 minutes. The egg whites will form stiff peaks when finished. Once the meringue is formed, add it to the pumpkin mixture a scoop at a time. Fold the meringue into the pumpkin batter slowly until it is completely incorporated. Don’t mix aggressively or the meringue will lose its ‘springiness’ and the mixture will fall flat. Now it’s time to get that cheesecake in the oven. 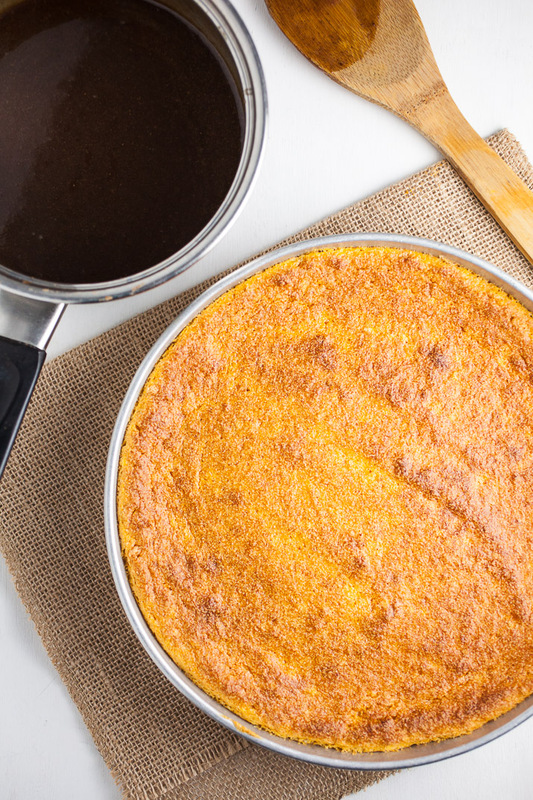 Spray an 8″ round cake pan generously with cooking spray. Don’t be shy with the cooking spray – you don’t want your glorious creation to stick. Pour the pumpkin cheesecake batter into the pan and spread evenly. It’s best to bake the cheesecake in a water bath so that it cooks evenly. Wrap the cake pan with aluminum foil and place it into a cake pan. Pour an inch or so of water into the pan (careful not to get any in the batter). Carefully place the cake pan in the oven and bake for 40 minutes or so. Once the 40-minute mark hits, turn the oven off and keep the cheesecake in there for another 15 minutes. At this point, the top should be nice and golden and the cheesecake should be finished cooking. Remove from oven and let cool completely. Now for the really good stuff – the caramel sauce that gets drizzled on top. This caramel sauce gets spiced up a bit with some cinnamon and nutmeg. Caramel sauce may be intimidating but it’s super easy to make. 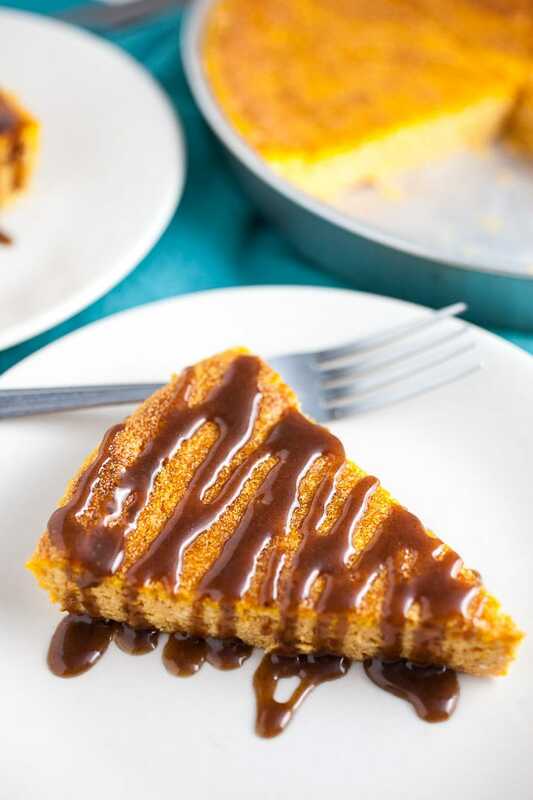 I love adding caramel sauce to pumpkin desserts. It adds a nice bit of richness. Much of the sweetness in this dessert comes from the caramel so I highly advise not skipping it. To make the sauce simply melt 3 Tbsp. of butter in a small saucepan over medium-low heat. Add 3/4 cup packed dark brown sugar and slowly let the sugar melt into the butter. Stir the mixture with a whisk. Once the sugar has melted, slowly add 1/3 cup or so of heavy whipping cream, whisking constantly. Let the caramel simmer on a low heat until it reaches a creamy consistency. Add 1/2 tsp. cinnamon, 1/4 tsp. nutmeg, and a generous pinch of salt. The key to caramel is to stir constantly so that it doesn’t burn. Once it’s nice and creamy remove from heat. Once the cheesecake has cooled it’s time to serve! Cut a slice and drizzle with the desired amount of the cinnamon caramel sauce. 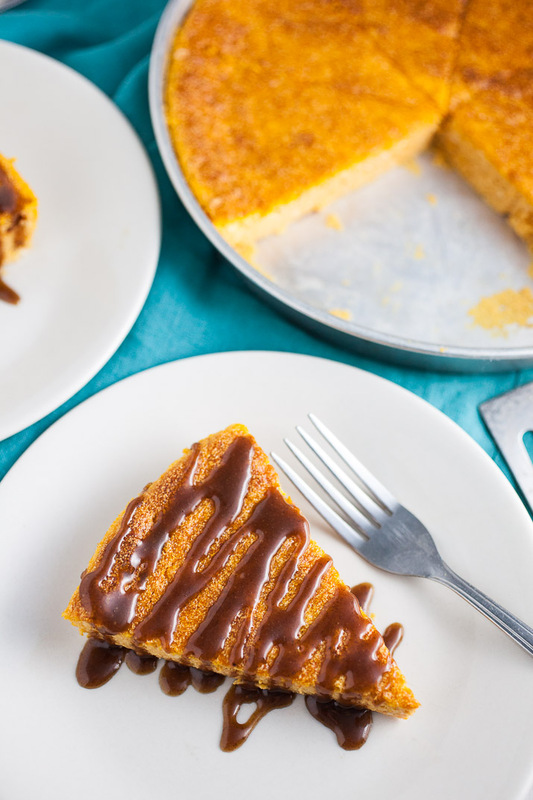 The spices in the caramel sauce give this cheesecake its characteristic ‘pumpkin pie’ flavor. I’ll always gravitate toward my favorite pie recipes when it comes to fall baking but I’ll make an exception once and while. This pumpkin cheesecake is one such exception. KitchenAid Whisk Attachment – You’ll need this to whip those egg whites into gorgeous stiff peaks! Separate 6 eggs. Place the yolks in one bowl and the whites in another bowl. Whip one 8 oz. block of room temperature cream cheese with a hand mixer until light and fluffy. 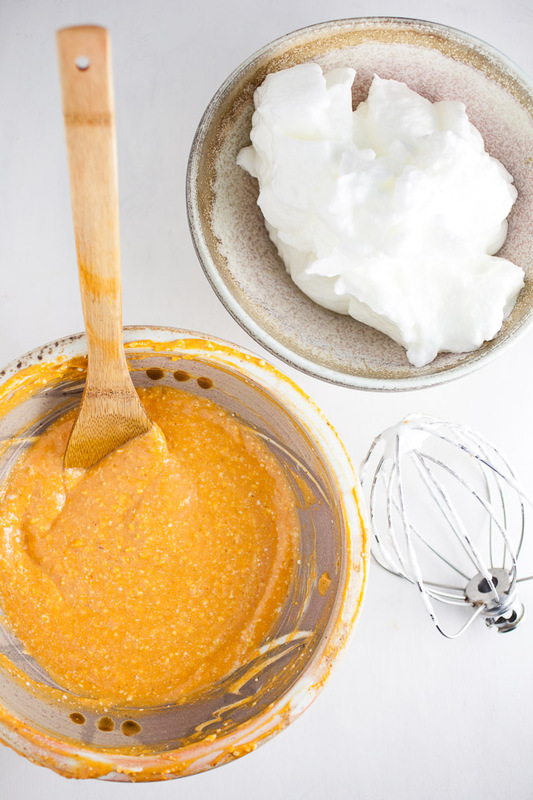 Add whipped cream cheese to the egg yolks along with 1 cup of pumpkin puree, 1/2 cup sugar, and 1 tsp. vanilla. Mix until all the ingredients are combined. Place the egg whites into a Kitchen Aid stand mixer and beat on medium-high speed with the whisk attachment for 7 to 8 minutes or so or until the meringue has formed stiff peaks. Add the meringue to the pumpkin batter one scoop at a time. Fold the meringue in slowly until it is all incorporated. Be careful not to mix too vigorously or mixture will fall. Spray an 8-inch cake pan generously with cooking spray. Pour the cheesecake batter into the sprayed pan and spread evenly. Wrap the cake pan in aluminum foil and place into a cake pan. The round cake pan should fit snugly into the cake pan. Pour an inch or so of water into the rectangular cake pan being careful not to get any water in the cheesecake batter. Carefully place the cake pan into the oven and bake for 40 minutes. Once it has baked for 40 minutes, turn off heat and keep in oven for an additional 15 minutes. Once the cheesecake has baked remove from oven and let cool completely. Cut the cheesecake into pieces and drizzle with the desired amount of the caramel sauce. Cream cheese must be room temperature. Regular brown sugar can be used instead of dark brown sugar. You had me at cheesecake. And again at pumpkin!!! Such a great combo, right? That caramel sauce sounds divine <3 <3 Great way to jazz up a holiday classic! What a great recipe without the use of a springform pan! Can’t wait to try it out. The Japanese make the BEST desserts! I agree, I think a lot of people don’t have springform pans readily available and this allows them to still put together a delicious dessert!